Captain H. Bower, who arrived in the Tarīm Basin in 1890 by order of the British Indian army, was at first not particularly interested in old manuscripts One day, however, he decided―perhaps on a whim―to buy an old manuscript for sale at a shop in the market . 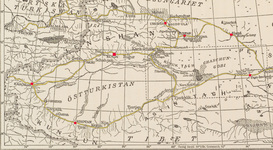 Bower had come to the Tarīm Basin to investigate the murder of the English merchant A. Dalgleish. The crime had occurred in 1888 in the Karakorum Mountains(1), along the path which had served as the main route to enter the Tarīm Basin from Northern India. Probably Bower decided to buy the manuscript from a local man in Kucha in the same way one buys a souvenir. But the manuscript he happened to buy was an incredible find―whose impact would ripple around Europe and throughout the world. And, it was this purchase, which would ignite the great era of exploration in Central Asia. The manuscript purchased by Bower was written in the Brāhmi script of ancient India. Deciphered by the British scholar of Indian studies, A. F. Rudolf Hoernle, it was revealed that the manuscript could be as old as the 5th century. It was older than any other manuscript found in India up till that time, and it came as a tremendous surprise that such old manuscripts were found in the outlying Tarīm Basin, rather than India. Until that time, most people thought ofthe Tarīm Basin (Chinese Central Asia, Chinese Turkistan, or Sinkiang)(2) as a barren desert -utterly inhospitable to humans-, surrounded by some of the world’s most famous mountains. Despite its reputation as a place barren of life, the area also attracted the attention for a different reason, as part of the strategic rivalry between the colonial powers of the time. In what is now known as the “Great Game,” Russia from the north and Britain from the south (from their base in India) clashed in their attempts to seize West Turkistan and reach further south as the China of the Qing dynasty did what it could as well not to lose control of this region that had been historically off and on under its control. The discovery of Bower’s manuscripts, however, added fuel to the fire, focusing even greater attention to the region. Indeed, the area was home to a rare treasury of antiquities, where ancient cultures flourished and where the dryness and sand had help ensure the preservation of this rich heritage. After the finding of the Bower Manuscript (named after the man who discovered the manuscript), the diplomats of Russia and Britain from their consulates in Kashgar began to collect old manuscripts―many which were brought to them by the local treasure finders (Turdi, One of the Treasure Finders Who Participated in Stein’s Expedition(3)). And, from this practice of buying manuscripts from local treasure hunters, the Westerners began to organize entire expeditions of their own from their home countries to search for antiquities in the desert. During the twenty some years from the discovery of the Bower Manuscript to the First World War, expeditions from many countries, such as Sweden, Britain, Germany, France, Japan and Russia participated one after another in the race to obtain buried cultural properties. What became a race for antiquities staked the explorer and his country’s reputation to gain as much knowledge and as many high-quality artifacts as possible in order to achieve better results than the other expeditions.